Poll Tracker: Will the debate break 3-way logjam? If anything could have an impact on the election campaign, it could be tonight's debate. Little else seems to be shifting the numbers. After six weeks of campaigning, nothing seems to have been able to break the three-way deadlock in the polls, but maybe tonight's Globe and Mail debate will do the trick. The CBC Poll Tracker, incorporating the data from all the latest polls, including four released on Thursday, still gives the New Democrats a narrow edge over their rivals. The party leads with 30.9 per cent, followed closely by the Conservatives at 29.8 per cent and the Liberals at 29.3 per cent. The Greens are averaging 6.1 per cent, while the Bloc Québécois stands at 13 per cent in Quebec. The polling average has been shifting on a day-to-day basis by no more than a few tenths of a percentage point, with no party enjoying any sort of momentum. And none holds a significant advantage — the margin between first and third has not been larger than 2.3 points over the last week, and it currently stands at just 1.6 points. Though the margin of error plays havoc with the order of the parties in the polls, overall the numbers are fairly consistent. Three of the four polls published Thursday had the New Democrats at 30 per cent and the Conservatives between 30 and 32 per cent. The Liberals registered between 27 and 31 per cent in all four surveys. This close race is reflected in the seat projection, which currently gives the Conservatives an average of 116 seats, the NDP 115 seats, and the Liberals 109 seats. The likely ranges show the wide array of potential overlapping outcomes: 100 to 141 seats for the Tories, 101 to 130 seats for the NDP, and 83 to 119 seats for the Liberals. Might the debate break the logjam? 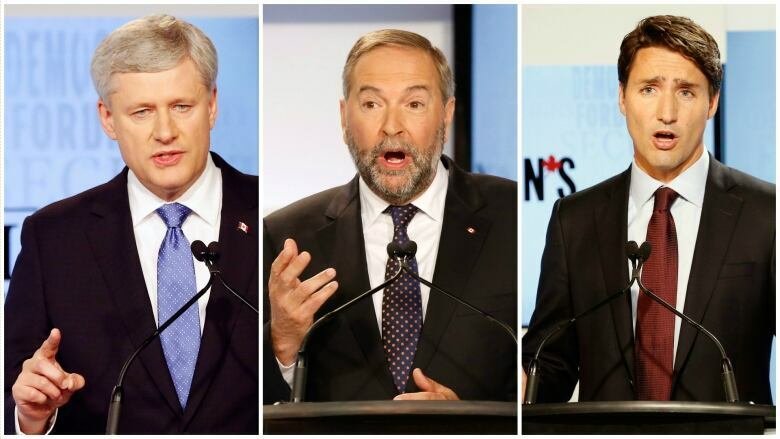 The first debate, held on Aug. 6 and hosted by Maclean's, did seem to coincide with a shift in the polls. At the time of the debate, the Liberals were trailing in third by a margin of almost seven points behind the leading New Democrats. A week later, that margin was down to four points, and apart from an NDP surge in mid-August and a Conservative slump in early September, the race has held as a close three-way contest ever since. If the dial will be moved, it could have the most effect in Ontario and British Columbia, where things remain tight. The Liberals lead in Ontario with 35 per cent to 33 per cent for the Tories and 25 per cent for the NDP. In volatile B.C. the New Democrats have the edge with 33 per cent versus 30 per cent for the Conservatives, 26 per cent for the Liberals and 10 per cent for the Greens, whose leader will not be taking part in the Globe debate. The leaders will be waiting until the two French-language debates to make their move in Quebec. As it stands, the NDP still holds a wide lead there with 43 per cent support, against 24 per cent for the Liberals (who have been showing a little life in the polls in Quebec of late), 15 per cent for the Tories, and 13 per cent for the Bloc Québécois. Whether the Globe debate will affect the race will only become clear in a few days. Watch the debate tonight, and then watch the polls next week.